Am I am sucker for any type of foodie vlog/blog post. I love seeing what other people buy at the supermarket and when I popped out a Twitter poll to see if anyone would be interested in my grocery shop (because you know this is what people do with their lives now) over 90% of people said YES! My bits and bobs. Snacks, drinks and things for on the go! Nuts - Yes... I am obsessed with nuts. Mixed nuts, nut bars.... I cannot get enough! Yes they are 'fattening' but I'd rather have a hand full of nuts then a chocolate bar, they really do keep me full and hit that craving for snacky food. I grabbed this handy glass jar from poundland (yes hello bargain) to keep my stash in and it looks fab! Green Tea - I cannot live without green tea. I started drinking it about 6 years ago and can drink anything from two to ten cups of it a day. I love the stuff! Superfood Powders - These are actually something I've only recently got into. I am LOVING using our nutri-bullet at home and popping in superfood powders into smoothies is a great way to get lots of extra micro-nutrients into my diet. 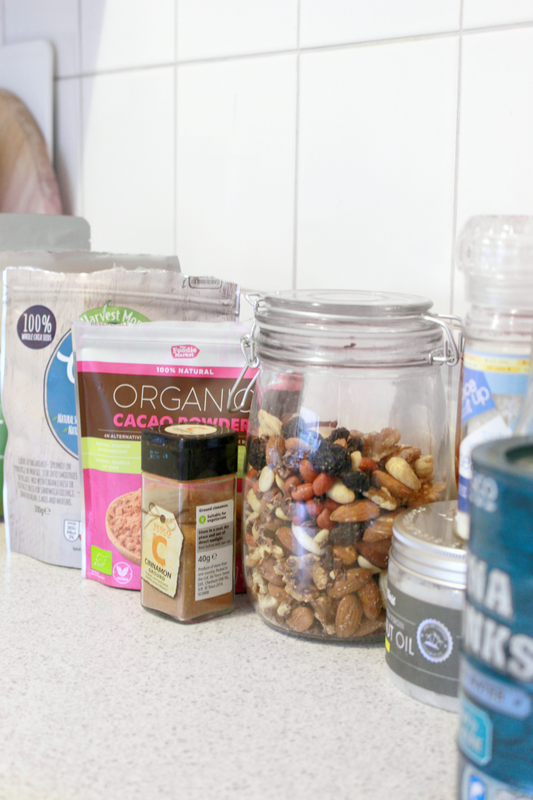 My FAVOURITE is Cacao Powder, I have this everyday in my morning smoothie with bananas, ice, protein powder, cinnamon and honey and it honestly tastes amazing, like a chocolate milkshake. Plus it's a mood-booster and I really do feel it work, each morning it helps to perk me up and put a little spring in my step. Apple Cider Vinegar - This is something I use as a dressing for my salads, lots of health benefits and you only need a tiny bit for flavour! Rock Salt - Oooo I love adding a bit of rock salt to my dinners! Tuna - A HUGE staple of my diet is tuna. I love a tuna salad and have one most days for lunch so having a stock of tins is essential! Coconut Oil - Fabulous for almost anything - from hair to coffee I use this stuff ALOT. Thsi is definitely a product to shop around for, now that it's so popular prices of coconut oil have increased immensely but you can still buy it for under £3 if you shop around! Here's one from Tesco that's only £2.25 for 500ml! Cinnamon - The perfect sweetener to add into smoothies and sprinkle onto apples slices. Honey - Can't live without the stuff - I always buy squeezy bottles because I'm lazy! Baby Spinach, Cucumber, Cherry Tomatoes - these are my basic salad bases. They will always be in my lunch/dinner as the base of my meal. Granny Smith Apples - My favourite apples... don't argue with me on this one! An apple a day and all that jazz. Bananas - I always have a huge stock of bananas on the go - I normally have 2 in my morning smoothie and they are perfect for having as a snack on the go. Avocados - Now I don't buy these every shop..... mainly because I can't afford it but avo's are such an amazing source of healthy fat and they really help to fill me up when popped into lunch or dinner! I tend to buy the packs of smaller avocados as too not over-do the portion size. Yes... I buy frozen foods. I know some people may frown upon this but, for me, it is mainly for budget reasons. 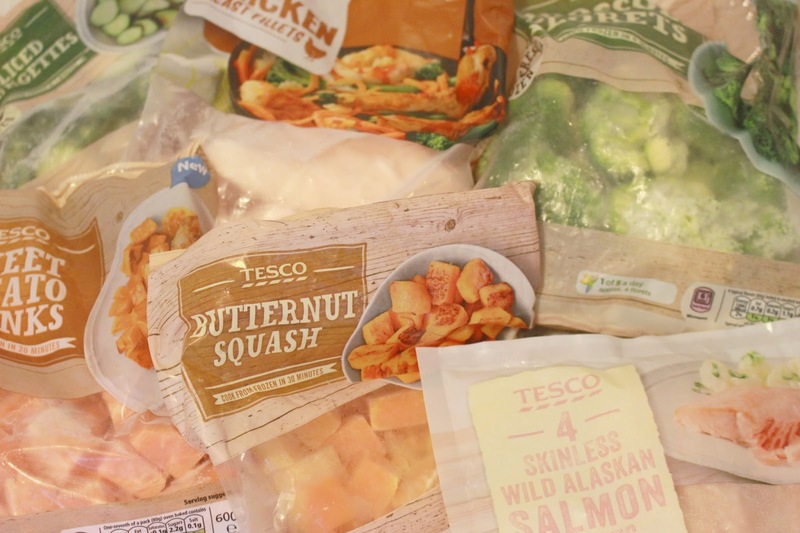 My vegetables, chicken, fish all last ALOT longer when bought frozen and I know I will have food for weeks.... rather than having to look at the 'use by' dates and knowing it will be gone within a week! Sweet Potato Chunks - These are a staple, I am obsessed! I buy these from Tesco and have them more or less every day. A fab carb that doesn't bloat me ... winner winner! Butternut Squash/Courgette/Vegetables - Frozen veg saves me so much money. Mini Chicken Fillets - I know frozen meat probably isn't the greatest but for me it saves me a lot of money. These frozen mini fillets only take around 20 minutes in the oven and are the perfect source of protein to add to meals. Salmon - Again, a great source of protein to add into meals! Salmon and tuna are pretty much the only fish I buy. Ice Cubes - Smoothies aren't the same without ice cubes! 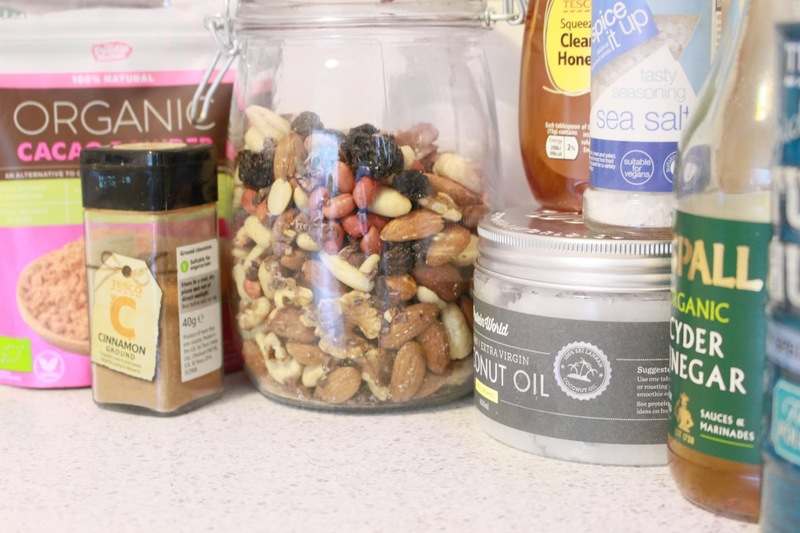 What are your go-to essentials from the supermarket? What a cool idea for a blog post! 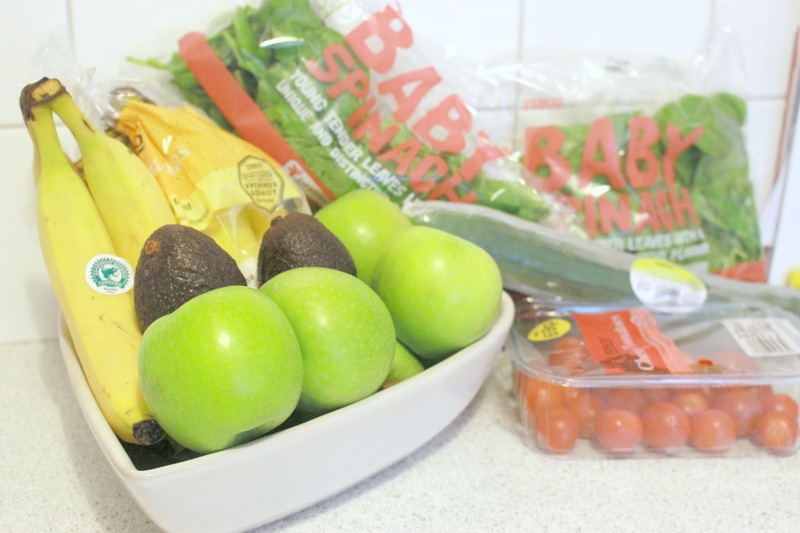 Along with a pizza, two garlic breads and the ingredients for a good ol'spaghetti bolognese that our household eats weekly, we also stock up on fresh fruit and ketchup (as I have it on ALL of my hot dinners).